Oh, this commercial is so '80s it practically has a popped collar. 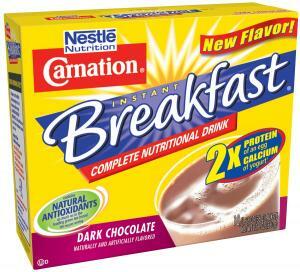 Remember Carnation Instant Breakfast ("you're gonna love it in an instant!")? I thought they stopped making it, but it seems to be all over the Web still. But you've gotta check out the ad. The '80s hair on the first chick! The chunky businessman who drinks it while ironing his pants! The last girl, who serves it to herself in a wine glass while putting on the most hideously 1980s patterned stockings! I kinda wish I had a glass of it right now. Do you remember these? I remember eating them in the late 70s. They were so great! I loved the Carnation Breakfast Bars! BRING THEM BACK!! Oh my God, you just brought back every memory of every time I had to have teeth pulled and couldn't eat solid food for a day or two. I don't get it??? With a product as great as Carnation Instant Breakfast bar (from the 70's/ 80's) Why did Carnation discontinue it? And even worst, with all the chatter about them (from folks of our generation) why won't Carnation bring them back? I called Carnation with no success and want to start a petition for them to relaunch the product.